This is a simple salad with just a few ingredients, but boy do those few ingredients work well together! 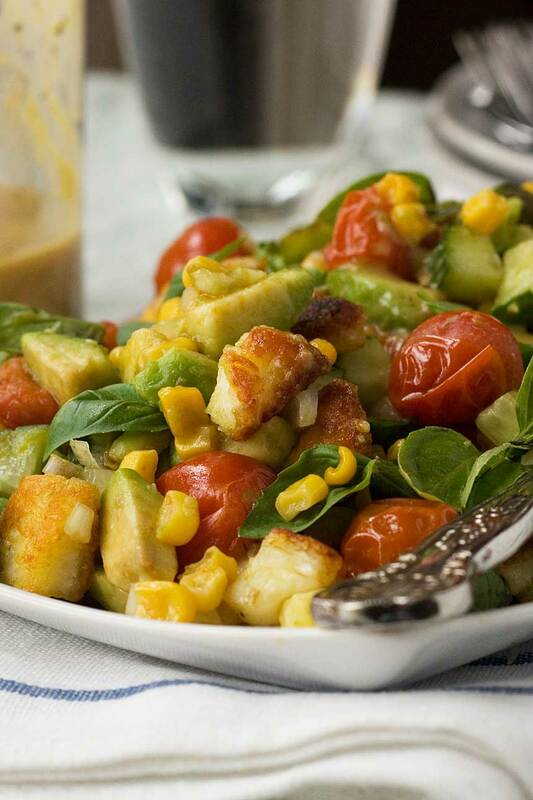 Roasting the tomatoes and corn makes it a warm salad, and scattering crispy halloumi and drizzling a honey and mustard dressing over the top gives it great texture and taste! With no sign of summer arriving yet here in the UK, we’ve still been craving wintery foods. When you’ve been taking a hot water bottle to work to keep warm (it’s an old building!) and it’s been colder than Christmas day was, salads aren’t the first thing that jump to mind when you’re thinking about what to make for dinner. But as I type, with the TV news on in the background, the BBC weather girl is predicting a warm and sunny few days. So perhaps I can not only look forward to a hot water bottle-less week, but a chance to eat some delicious salads too! Credit where credit’s due, I first spotted something very similar to this tomato, corn, avocado and basil salad on David Leibovitz’ brilliant Paris food blog. 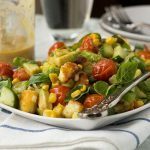 I chose to roast my tomatoes and corn and add crispy halloumi to make it a warm salad, but in truth there’s plenty of scope for putting your own twist on this winning combination of flavours. David suggests finding the best ingredients you can (always a good plan, especially when there are only a few ingredients in your dish) and using really fresh raw sweetcorn. Realistically though, on a busy day, I don’t have time to run around looking for the freshest and best. So I decided to make the best of what I can find by roasting my tomatoes and corn for ten minutes, throwing in plenty of leaves from our thriving window-ledge basil plant, and scattering over cubes of my latest food addiction – cubes of crispy halloumi cheese! As with any salad, my suggested quantities are just that: a suggestion. Feel free to roast or not roast your tomatoes and corn – grill your corn and then shave it into the salad if you prefer. I decided to go with a simple honey and mustard dressing, but use your favourite dressing instead if you like. 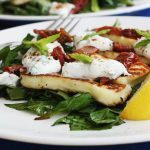 Use feta or goat cheese instead of halloumi if you can’t find halloumi or aren’t keen on the idea – although I really would recommend giving that crispy halloumi a go (if you’re in the UK, you can get it from Aldi really cheaply). Just a couple of things I would bother about, though. Try to find a nice firm avocado (a softer one sort of ‘melts’ into the salad, and not really in a good way!). I’d also recommend serving this on a big plate with the halloumi scattered on top so that it stays crispy, and letting everyone drizzle over their own dressing once they’ve got the salad on their plate. Just to keep everything nice and fresh and delicious. The only problem is finding the willpower not to eat all that gorgeous crispy halloumi before it makes it to the salad. Halloumi is very ‘meaty’, so you can serve this salad on its own with some nice fresh bread, or with some chicken or fish or whatever you choose on the side. Let me know what you think of the halloumi. I’m REALLY addicted and have got another ‘log’ of it in the fridge to make these crispy halloumi fries again soon! A simple salad with roasted tomatoes and corn, avocado, and basil - all topped with crispy halloumi cheese and a drizzle of honey mustard dressing. Lovely eaten by itself or with crusty bread and a protein of your choice. Addictive! a large handful of fresh basil leaves. Pre-heat the oven to 180C / 355F, then roast the tomatoes and corn on a baking tray for 10 minutes. Meanwhile, heat the oil in a large frying pan, then add the halloumi cubes. Let cook for two or three minutes without moving, then toss and let cook for a minute or two longer. Repeat until the cheese is well browned and crispy. Drain on kitchen paper. 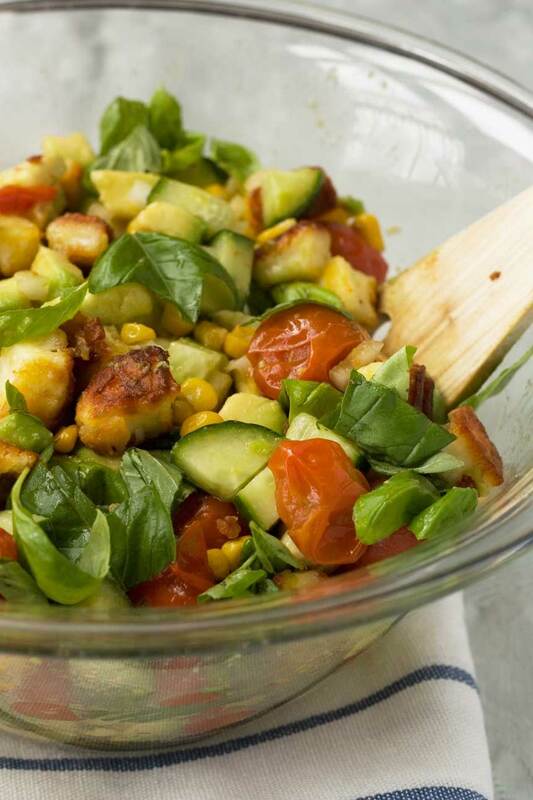 When cooked, tip the tomatoes and corn onto a large plate or platter, then add the cucumber, avocado and onion. Stir through the basil, then scatter the crispy halloumi over the top. Whisk together the dressing ingredients in a food processor or blender. Serve the warm salad immediately, with the dressing on the side. 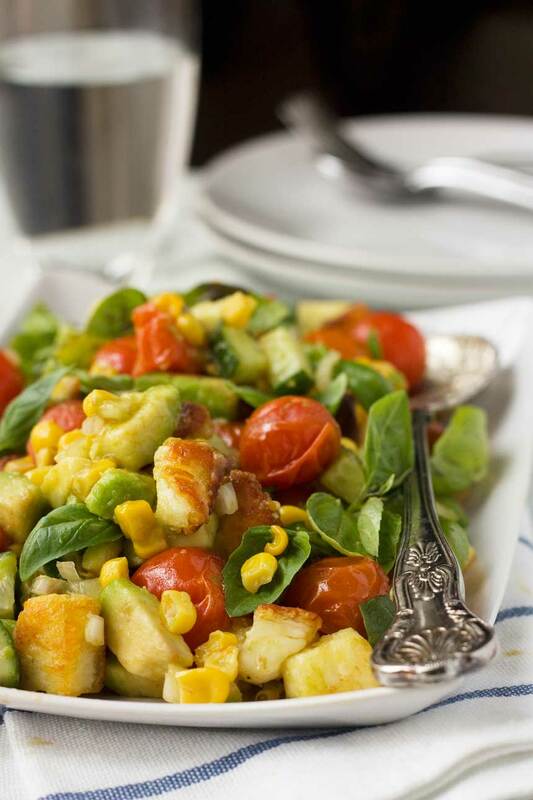 Adapted from David Leibovitz' delicious fresh corn, tomato, avocado and basil salad. If you prefer, however, you can use fresh corn. Grill it, then shave it off and into the salad. You don’t have to roast the tomatoes and corn if you don’t want to. If you decide not to, simply chop the tomatoes in half and use the corn as is. Feel free to use a different kind of cheese in this salad e.g. mozzarella, feta, goat cheese – you could still try cooking it! Serve this salad by itself (halloumi is quite ‘meaty’! ), or with crusty bread and a protein of your choice e.g. salmon, chicken, sausages, burgers. Made one of my recipes? Take a pic and tag @scrummylane on Instagram so I can see it! You can also find more from Scrummy Lane on Facebook, Pinterest, Twitter and Instagram and follow me on Bloglovin! Thanks so much for reading! Halloumi AND avocado? I am totally on board with that. I have been eating loads of these kinds of salads recently, as they are really filling. Sorry about the weather, I’m sending sunny vibes your way. This is a salad I could eat anytime, I love roasted tomatoes in a salad. Hi Janette – thanks so much for the sunny vibes. They’re working!! Huh? What is with the WEATHER over there!!! We had crazy storms last weekend but now it’s like summer is back, I was at the beach yesterday! 🙂 I had a giant greek salad last night, was thinking of you. I had the feta crumbled though, not the proper way in a chunk! 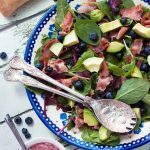 This looks fabulous, all my fave salads in one yummy salad! I absolutely love halloumi. And I have officially called summer down south, it’s been 27c all week!!!!!!! Hi Mariana! I know my fellow UK blog buddies always appreciate a nice bit of crispy halloumi. Thankfully it’s been nice here this week too – I love summer, but shame it’s so temperamental! Oh, I hope so too! It just keeps raining and raining and raining over here. Tell it to stop!! I love how versatile this salad is, Helen! Halloumi is one of my absolute favorite cheeses and, when you make it crispy – even better! Love everything about this salad! The dressing sounds delicious, too! 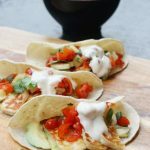 Great idea to add crispy halloumi!Pinning to try it. Hope the weather warms up soon! Thank you Mira! Unfortunately it is THROWING it down with rain right now and has been all week. Yuck! Girl I am on a salad kick lately and love how easy and delicious this salad is!! 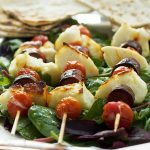 I love love halloumi so totally trying this out! Look at all these colors and flavors! My kinda salad, any time of day! Hi Katherine! Are you helping Maggie out? Anyway, nice to ‘meet’ you and thanks for visiting!